The publisher presented autumn highlights last night at Christ Church, Spitalfields, with the evening introduced by Jamie Hodder Williams, ceo of Hodder & Stoughton and John Murray. The showcase evening saw authors, including veteran newsman John Simpson, chat show host and novelist Graham Norton, and The Last Leg's Andy Hills, reading and discusssing their work in front of a key trade audience. Authors later mingled with guests over dinner and afterwards there was a bar and band in the crypt of the deconsecrated church. 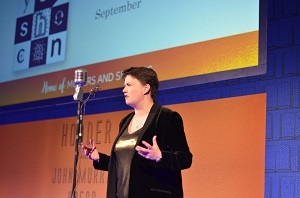 New books were revealed from Adam Hills, Best Foot Forward; Jaspar Fforde, Early Riser; Michael Parkinson, George Best: A Memoir and Tory rising star Ruth Davidson, Yes She Can. Hills, Fforde and Davidson (pictured) appeared on stage to talk about their books. John Murray has Yes She Can, which features interviews by the Scottish Conservative leader with prominent or exceptional women such as Theresa May and Melinda Gates. Davidson is regarded as one of the most promising Tory politicians of her generation; she is also an ex-journalist. TV comic Adam Hills, the Australian host of Channel 4's hit show The Last Leg, was on hand to promote his Best Foot Forward, about his missing foot and its positive effect on his life and work, due in July. Rachel Heng read from her debut novel Suicide Club and Mike Gayle read from The Man I Think I Know, out in November - " I think this is my best yeat," he commented, until his next, he said, Half A World Away, currently being written and due in April 2019. It was revealed that John Grisham is coming over to promote this year, his first visit for five years - he has a new legal thriller coming out on 23 October. Likewise Jodi Picoult is touring for A Spark of Light, out on 28 October. From John Murray comes thriller from John Simpson. Not strictly speaking his first - he dabbled in fiction over 20 years ago - this book will have a timely twist, featuring as it does the assassination of enemies of the Kremlin. James Frey returns with Katerina in September, describe as a novel - that was stressed - and a prequel and a sequel to A Million Little Pieces. Frey will be coming over from the US to promote. TLS editor and Front Row presented Stig Abell talked about his new book, How Britain Really Works, looking how the country actually functions, a modern-day take equivalent perhaps to Antony Sampson's Anatomy of Britain. His conclusion? "We will go on, going on." TV presenter and historian Dan Snow talked enthusiastically about On This Day in History, out in November, in which he picks one significant event from history for each day of the year. "People are interested in history only if there is an anniversary attached." Yesterday was the Ides of March, but also apparently a critical day in American history when Washington persuaded his army not to stage a military coup. Snow revealed later over dinner he will be back on TV in the autumn with a major series on shell shock in the First World War, and its later manifestations as PTSD in subsequent conflicts, and its ongoing effects on British society. John Murray also has a bottom-up history of D-Day by Giles Milton, out in September, featuring interviews with soldiers from both sides and French civilians. Also on serious non-fiction is a look at Henry VIII through the men, not for once the wives, that made him by Tracy Borman, a biography of Victoria by Lucy Worsley and Theatre of the World - 'how maps made history and history made maps' - by Thomas Reinertsen Berg, which is turning into a something of a rights success. Susan Calman "a short fat Scottish lesbian," in her own words, took to the stage to talk about her new book, Dancing for Joy, out in September, outlining her transformative experience of being a Strictly contestant. The press also celebrates it 250th anniversary this October with the publication of Dear Mr Murray, edited by David McClay, featuring letters sent to the house by its famous authors over the last quarter of a millennium.